Sony VPL-VW80 review | What Hi-Fi? Weighing in at some 12kg – and a wallet-slimming £4500 – the Sony VPL-VW80, part of Sony's Bravia range, is clearly not planning on doing things by halves. Thanks to a flattering black finish and plenty of curves in the right places, this substantial proposition carries its bulk well, but you'll still need a 47x48cm space on which to plonk it. 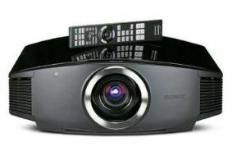 You'll find two HDMI inputs – it's a Full HD resolution projector – plus component, S-Video and composite video connections. Allow the VPL-VW80 to whirr into action and not only will you notice that it's rather quiet (operating at less than 20dB) but also that it's an absolute doddle to set up. Using the motorised lens, you can zoom, focus and generally shift the picture around with ease. We had the image fitting our 7ft screen perfectly in moments. Considering some projectors can be only slightly less complex to work than the Large Hadron Collider, this is not to be sniffed at. Watching Pixar's Ratatouille, we found the Sony successfully uncovers an almost disconcerting amount of detail, and delivers a confident, balanced image with an impressive sense of depth. The opening scene of The Shining on Blu-ray shows the Sony's super-smooth motion, while black levels, as demonstrated by a DVD of The Dark Knight, have real depth. Okay, so it's on the large side, but everything else about this Sony is a pure joy, from its ease of operation to its sublime performance. If you're in this market, the VW80 should be a shoo-in for your shortlist.